I have a new favorite piece of Buddhist snark! I think a lot about the writing of seemingly uncomposed things—restaurant menus, instruction manuals, catalog copy, and all those things we assume are not the work of artists. They are, of course. I have been moved by a fine and readable terms of service (google writes the best ones) much like a poem describing a summer day. I enjoy good writing, and all the more when it is a type of writing we ask very little of, because such composition is an intense act of caring. 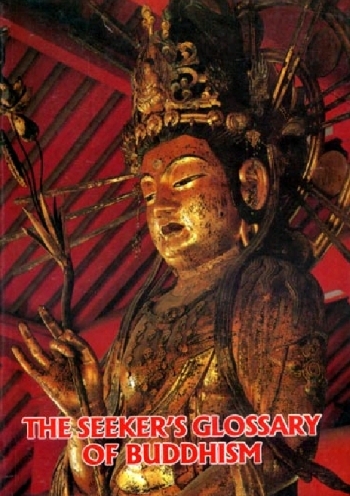 The Seeker’s Glossary of Buddhism, put out by the now websiteless Sutra Translation Committee of the United States and Canada, tries to come off as an uncomposed text: it is a amalgam of entries from different sources, indexed and cross-referenced. The selection of articles is extremely broad, though sometimes lacking in depth, and I keep one by my desk to turn to when more scholarly references works fail me. There’s some interesting discussion going on about Western Buddhism. Scott Mitchell blogs about the problems with a notion of Western Buddhism that’s a simple intersection of “Buddhism” and the “West.” His post was interesting enough for Tricycle to re-blog, followed up with the question of whether it’s even kosher to talk about the “West” at all. Brooke Schedneck writes about Western Buddhist teachers who define themselves in opposition to other Western Buddhists. Most recently, Kyle Lovett satirizes of 15 types of Western Buddhists, with “insular Asian Buddhists” segregated to a spot at the end. This collection of posts all deal with the struggle of defining Western Buddhism as a singular concept. Scott’s venn diagram harks back to a constant refrain in Buddhist studies—that there is not just one Buddhism, but many “Buddhisms.” Much the same can be said about the “West”—i.e. which West are we talking about? When used as a geographic demarcation, a term like “Western Buddhist” is simple and straightforward. Any Buddhist denizen or native of a Western locale is a “Western Buddhist”—at least in the case where “Western” refers to the Western world (rather than, say, a Buddhist of Western Australia), including locales on all inhabited continents. With his signature crass humor, Kyle writes in this direction. He points out that Western Buddhists include a vast medley of very different (and potentially) annoying types. On the other hand, “Western” can have strong cultural—even racialized—undertones. “Western” becomes a proxy for us or them, drawing lines through nations, neighborhoods and even congregations. When defined in contrast to Asian, the designation cuts out the majority of those who have practiced Buddhism in Western nations—individuals like myself. I doubt there will be any solid ground where we can refer to the “West” and not step on the cultural and historical sensitivities of this term. Nevertheless, people do identify as Western—myself included. Perhaps the paradox is that we cannot refer to Western Buddhism without at the same time compromising our Western ideals, such as democracy, egalitarianism and fairness. Will Buckingham mentions the investment of a meditation center in a dowser, bringing up the important question: what’s the relationship between a dowsing and a meditation center? The answer, from the outside, is obvious: that Western Buddhists are part of a much larger world of curious beliefs, ranging from dowsing to homoeopathy to crystal healing to angel spirit guides, a well-meaning hodge-podge lacking in much rigour and in which it is possible to move seamlessly from talking about the neuroscientific evidence for the benefits of meditation to talking about ley lines, reiki and how to find your shamanic power animal. And in these kinds of situations, it is considered somewhat unseemly to raise questions about pesky things like evidence, or how all this is supposed to work or hang together. It is this hodge-podge that has, over the years, made me increasingly uneasy with the various forms of Buddhism in the West, and the broader cultural context in which Buddhist practice takes place. Sometimes it seems that Buddhism in the West is a strange cocktail indeed: 1/3 Blavatskyian new age speculation; 1/3 distillation of Buddhist texts; 1/3 psychobabble; and a pinch of science for added flavour (optional). Shake vigorously, warm slightly over the fires of good intentions, and consume. There. Now don’t you feel better already? I suppose if I were in Buckingham’s situation, I would just feel a bit uneasy to know my donations were being put towards a dowsing contractor. Some Buddhist writers have an unquenchable fascination with Western Buddhism. Perhaps it’s due to a flaming sense of entitlement, zealous evangelism or cultural elitism. Regardless, I unfortunately seem to have an undying fascination with these people. Barbara O’Brien addresses Stuff White People Like, a blog and book by Christian Lander, noting that “Lander mentions Buddhism as a popular choice.” She then writes that “[w]hile Lander’s description of western Buddhists is exaggerated, I think it reflects how most westerners view western Buddhists.” But Landers was writing about white people, not Western Buddhists. After all, Western Buddhism isn’t white—or is it? This weekend I had the pleasure of listening to Dr. Lancaster, the brilliant and pioneering professor of Buddhist Studies, who gave a lecture at Hsi Lai Temple in Hacienda Heights. The title of his talk was “How Religions Learn,” though in the same way as many of my favorite speakers he used the talk as an opportunity to weave together his most recent thoughts and questions. But Dr. Lancaster’s topic is a point of interest for me. It points to an uneasy contradiction in any religion’s self-composed history: religions must learn and change to respond to the spiritual needs of the people, but one of these fundamental needs is to have an absolute and unchanging truth to anchor ourselves to. I worry that this contradiction is becoming increasingly insurmountable, and that religion is entering a place where it can no longer learn. I overposted over at Angry Asian Buddhist, so I’m continuing over here. Let me just say that I love Vince Horn’s recent post on the One City Blog. The problem with not seeing how Buddhism has evolved, and in not seeing ourselves as a part of Buddhism’s evolution, is that we can believe we are somehow the holders of the “essence” of Buddhism. But what is the essence stripped from the practices, realizations, models, and people who have contributed to this living tradition? Is there really such a thing? Could it be that the whole idea of there being an essence to Buddhism that is distinct from it’s extraneous forms–those forms that are so irrelevant that we can simply ignore them or dump them–is coming from a set of cultural assumptions that exist here in this place and time? We need to recognize that possibility, and see that there is a kind of violence in trying to strip something from its historical roots, and also a kind of arrogance in thinking that we can even do that successfully. Now I have to go read the comments! What does Western Buddhism mean for people of color? Okay, I know the title feels like a continuation of everything before (and it is), but it’s not because I woke up this morning itching to write another Angry Asian Buddhist post. Yesterday a student asked me about what it means to be Buddhist, so I decided to forward her a link to a post from a year ago, “What does it mean to not be Buddhist?” When I did a Google search for this title (too lazy to search my own blog!) the top article happened to be “American Buddhism: What does it mean for people of color?” written by Lama Choyin Rangdrol back in 1998. So you can imagine I was curious. Below are some thoughts from another writer, from the last century (so to speak), that spoke to me today.